In my previous update about moving back to San Diego after a year in Seoul I was still in a euphoric state where walking into the local pharmacy store CVS literally scared me. I was trying to become assimilated and jump back into the California lifestyle. This state lasted for about 2-3 months as I missed all of my favorite Korean destinations, stores, and foods but I was enjoying old favorites in San Diego and Los Angeles. Then my acculturation entered the toughest category of all, the separation phase or otherwise commonly known as the rejection phase. Why didn't I experience such severe culture shock when I moved to Korea? Why was this so hard upon moving back to the United States? Wasn't it supposed to be the other way around? 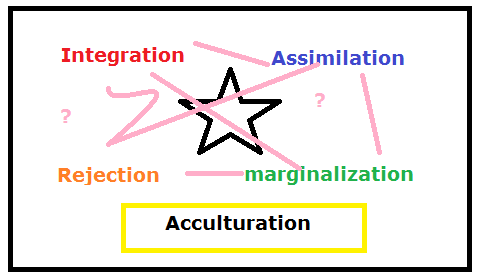 My acculturation process got stuck a the rejection phase for too long. Let me start out by saying, I have some of the best friends and family anyone could ask for. However, the first 2-3 months I was still missing everything about Korea. Then I grew into a deep state of depression. 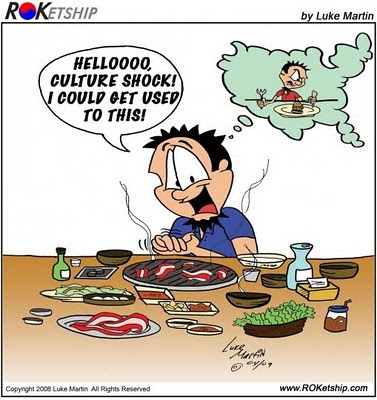 Everything about American culture became a huge turn off to me and I struggled to connect with the American way of life. I couldn't believe how much TV everyone was watching and I struggled to believe that Americans lived a healthy lifestyle. I saw so many people driving around in their cars all day and then waiting in line at the drive through windows at In & Out. I missed walking around the city streets, getting lost, and exploring new places. I couldn't do that here. Everything required a car, gas, time, money. Some of the best things in Seoul were free and all within walking distance. In America, I felt alone as I walked back to my house from the nearest parking lot on empty streets. I missed the crowded streets at 12 am on Monday nights and all of the bright lights and excitement. Everything back home just seemed dull. A part of me gave up. I wanted Asia and that was the only thing that was going to bring me happiness. I saw all of my friends from Korea traveling around the globe having the time of their lives and I was just sitting on my laptop typing paper after paper. Why did I give it all up? Just to get another piece of paper that reads Master's Degree? I am happy to say that after much re-seoulsearching, I finally feel comfortable at home in San Diego! Although the transition was tough, I will definitely be here after graduate school in December. My dreams are finally coming true. With several job opportunities upon graduation, my professional career as a ESL instructor is just beginning. This summer I will get my first peek into university teaching at the Japanese Women's University in Tokyo where I will be teaching for 3 months. Upon returning home I will be a teacher’s assistant in a local community college as well as a writing center instructor at another community college in San Diego. This experience will help boost me into the programs so that I can hopefully become a part time adjunct at any community college in California. Everything is happening so fast. In 1 week I am leaving for Japan. When I return, I will have my Master’s degree within 4 months. I will definitely be spending some time in Korea as soon as I am back on Asian soil. My blogging about Korea will never cease as my passion for the country is eternal. I hope many others have wonderful experiences in the country that brought me one of the best years of my life. As far as my acculturation process goes who knows. I think for the rest of my life I will be stuck in a state of marginalization, never fully accepting American culture or Korean culture. Korea changed who I am. I no longer identify fully with American culture. Bi-culturalism has become a part of my identity of which I am proud. I traveled to Korea 1996 and again 2007. Just 11 years difference. However, I felt like I traveled to 2 different countries. In short, Korea has transformed dramatically into more comfortable, beautiful and affluent country. Even now 4 years after my last visit, I am missing Korea a lot. Sadly the U.S. is getting behind Korea in different ways. One of my friends, who used to work for NASA ( National Aeronautics and Space Administration) with PH.D degree, went to Korea to teach English and live there. He says he is much happier in Korea than in the U.S. He is not in Seoul, but in the medium size city. He doesn't have a plan to come back to the U.S. Thank you for this. I got back from Korea in August and I seem to have fallen into this deep depression you talked about. I'm in grad school too and I'm quickly failing out and not sure what to do at this point. I'm so lost and grasping for anything. Even though our situations aren't exactly alike I am happy I'm not the only one who went through something like this.